U Win Thein, Chief Minister for Bago Region, offers opening remarks at the Lessons Learned Workshop on Land Use Planning for Bago Region. At a one-day workshop in Bago, Bago Region, three donor-funded projects introduced findings from pilot activities examining land use planning approaches at regional, township, and village tract levels. 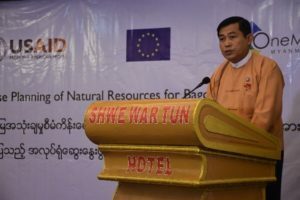 Implemented by the European Union at the regional level, OneMap Myanmar at the township level, and the USAID-funded Land Tenure Project (LTP) at the village tract level, the three projects shared their findings with government officials from nine departments to compare different approaches. Land use planning in Burma is at a very early stage and, historically, has occurred at higher levels of government without taking into account the perspectives of communities. Together, the pilots demonstrated how land use planning can benefit from the integration of both top-down and bottom-up land use planning techniques. For example, land use classifications determined at the regional level using remote sensing techniques need to be integrated with community perspectives on their land uses. Participants indicated that many of the data-driven and forward-looking concepts presented at the workshop were new. In particular, since community voices have not traditionally been taken into consideration in planning matters, the village tract level approach piloted by USAID LTP was considered a good demonstration of the value of community level participation. A regional official noted, “We are now in the democratic era and need to use the bottom-up approach and start implementing it. Then we can have proper and correct decisions for the public.” This engagement marked an initial, but important, step toward integrating land use planning at multiple scales in Burma. Development of inclusive land use planning approaches is essential for sustainable, long-term economic development of urban and rural communities in Burma. Effective land use planning builds the capacity of government institutions and related stakeholders to implement policy, legal, and regulatory frameworks that strengthen long-term stability and prosperity.